Lord of the Rings: Game One (released in North America as The Fellowship of the Ring Software Adventure) is a computer game released in 1985 and based on the book The Fellowship of the Ring, by J. R. R. Tolkien. It was the follow-up to the 1982 game The Hobbit, although did not reach the same level of critical and commercial success as its predecessor, and is considered vastly inferior by the gaming community, many complaining about the removal of the real-time aspects and complex AI patterns of the previous entry and puzzles that lacked coherent solutions. Lord of the Rings: Game One and The Fellowship of the Ring Software Adventure are actually the same game with two different titles. There are also some other minor differences between the two, such as different graphics and slight variations in the documentation. The game is in two parts and Lord of the Rings: Game One also includes a beginner's game. Both versions were sold with a paperback edition of The Fellowship of the Ring. 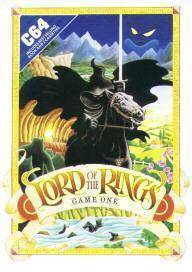 Lord of the Rings: Game One came first and was probably only distributed in Australia and Europe. The Fellowship of the Ring Software Adventure, on the other hand, was only distributed in North America. The Fellowship of the Ring Software Adventure is the second of The Tolkien Software Adventure Series. Lord of the Rings: Game One has also been released as part of The Tolkien Trilogy. This game should not be confused with the action adventure The Fellowship of the Ring which is in development by Sierra On-Line. Personal evaluation: This is one of the worst games I have ever played. Slow, totally lacking respect for Tolkien's works and the "graphics" are horrible. Play it once or twice for a good laugh.